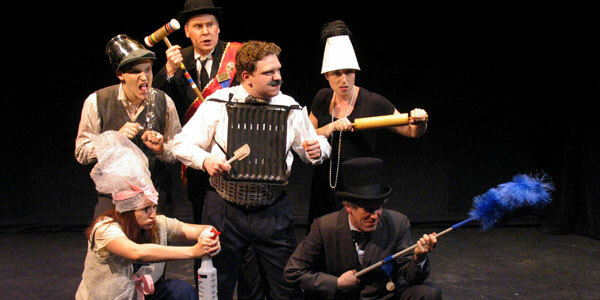 Dr. Ox’s Experiment is a comic parable in the vein of Candide and Gulliver’s Travels. This story has never before been presented as a play — though it has twice been made into operas! The town of Quiquendone, where the action unfolds, is a most unusual place. People live together in harmony, no one is troubled by passion, and everything moves very, very slowly. The explanation? Oxygen-poor air. Then one day a famous scientist comes to town. He has been hired to build a gasworks and install a modern street-lighting system, but really he’s increasing the oxygen level. And every time Dr. Ox turns the dial of his machine, life in Quiquendone gets a little crazier. Dr. Ox’s Experiment is a smart, funny, fast-paced show that raises some serious questions about science and human behavior. It was written for adults, but children over the age of 7 should enjoy it as well.